The property was nice but a few small issues- the hairdryer shuts off when run on high heat. There were three bathrooms but 1 hairdryer. Id suggest more in a place like that. Also the coffee grinder didnt work. Finally the master shower did not have hot water or was too hard to figure out. The house booklet also made it sound like we had to turn on the hot water but it was on. Id update that. We called management about these issues. They gave us two hours later to check out. I hope the issues get resolved for the next guest. 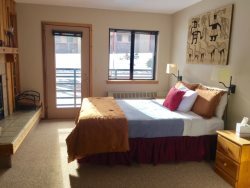 The condo overall was big and clean and great location for ski in and out. Kirkwood has few dinner options and not much of a village so come prepared with food. Did not need to interact with anyone for this particular lodging. Kim was very responsive whenever we called with a question. Unit 110 is the best location in Whiskey Tower, literally it is ski-in ski-out. The kitchen is well stocked which is much appreciated when cooking all meals. The futon advertised is just a futon pad, shouldn't be advertised as sleeping 5 because the 5th space isn't comfortable for anyone other than a child. Loved the condo. Requests for wood and parking passes were dealt with ASAP. Super prompt, hooked it up, tested it. Had a great time! Really nice property. Great booking and check in! I love pyramid peak properties and will continue renting with you guys at Kirkwood. However, unfortunately we won't be returning to this particular unit. Despite the great location, the unit was pretty shabby overall with partially painted wall, a can of paint up against the wall, missing blinds in the main living room, old and tattered carpet. We did greatly enjoy the wood burning stove, yet wish the firewood logs were a little smaller as most of them are too big to fit in the stove. Also, a lot of the firewood was wet. Seems like given the quality of this rental, $600 for a 2 night stay is pretty steep. Overall, we love you guys and love kirkwood so we'll be back with you, just not in this unit. Reservation was prompt and instructions provided were clear and concise. We arrived a bit early, unknowingly, and were quickly provided access to the house without issue. Our stay at Erins Eclectic Retreat was perfect. The house had all of the comforts of home and we were mesmerized by the penny floor. The furniture was very comfortable and everything we needed was available for our use, including games, a Bluetooth speaker for music, cable television, a bbq and all of the kitchen tools needed to prepare home cooked meals. To top it off, the house is a quick Uber ride from all the hotspots South Lake Tahoe has to offer. We plan to return to the retreat for years to come. All the staff took care of our needs in a very timely manner. The staff must enjoy their jobs which reflects on the management!! From booking to leaving, it was one of the most enjoyable weeks ever in Kirkwood! We will be back next year. We love the property as well as PyramidPeaks professionalism! Everyone I called was friendly, helpful, and informative! The property was great! Beautiful, well-equipped, and right next to the lifts. Not having to drive to the resort when the roads are bad was a real plus. No surprises, as advertised. We were very pleased to find everything we needed in the property (linen, toilet paper, shampoo, soap, even ziploc etc). Very nice location, true ski in ski out, close to commodities and no issues with parking. The residence itself is well located and the property is well laid out, maybe on the oldish side but overall convenient. Kelly and Kim are the best! Always was able to reach them by phone during our stay and very helpful. Basecamp #19 could use more lighting in the exterior entrance hall. I think a bulb must have been burned out because it was pitch black outside our condo door. We had to dig out our iPhone flashlights to find our door, which was no biggie. The entrance hall cement floor was filthy....how often it is mopped? Our clean boots had fresh, clean snow on them from the recent snowfall outside. When we walked through the entrance hall, that clean snow became quickly blackened with wet dirt by the cement floor. The door mat also looked like it hadn't been cleaned or replaced in years; so it was useless. So we had to stand outside our condo door to remove our boots one at a time, and step over the threshold in our socks to prevent tracking the black filth onto the kitchen floor. Besides asking the Basecamp building maintenance clean the exterior hallway cement floor once in a while, it would be helpful if #19 had a washable rug placed just inside the door for renters to use while taking off their boots. This was really the only "bummer" about #19! LOVE LOVE LOVE the ceiling heater in the bathroom....what a difference that makes for a pleasant shower! Placed my order by phone this time.